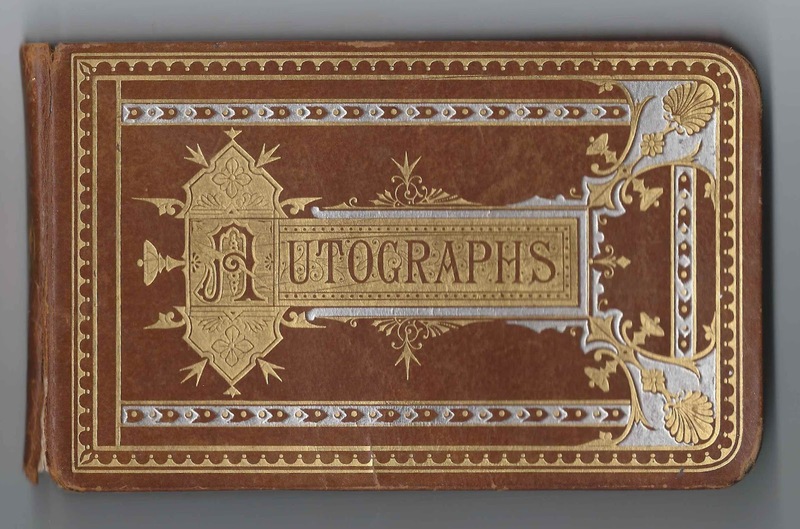 1870s/1880s autograph album comprised of pages signed mostly by staff and students at Gorham Normal School at Gorham, Maine. 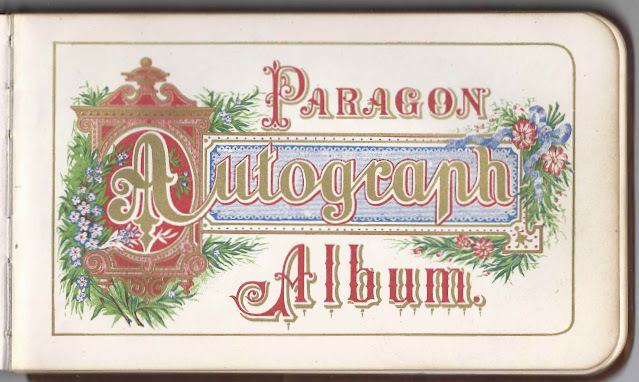 There's no ownership page, and none of the signers indicated the name of the album owner. However, there were several pages signed by people named Elden in the album, some of them far from Gorham. One of them, Nettie E. Chapman, called herself the album owner's cousin. She was Nettie Caroline (Elden) Chapman, daughter of Chase Boothby Elden and Marietta (Herrick) Elden and wife of Charles Henry Chapman. 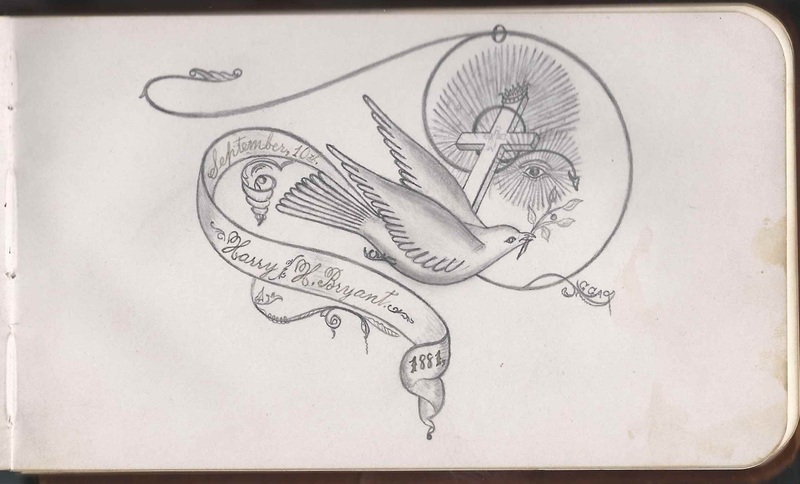 Because of this and after looking at a list of graduates in an 1881 catalog of the State Normal and Training School at Gorham, I'm thinking that this album might have belonged to Mary Phenix Elden, born 17 September 1862 at Buxton, Maine, daughter of William and Sarah B. (Elden) Elden. Mary's father was a brother to Chase Boothby Elden, which would explain a cousin relationship between Nettie and Mary. I don't believe Mary Phenix Elden ever married. She was living at Buxton, Maine, as late as the time of the 1940 Census. Interestingly, I found a reference to the memoirs of Mary Jane (Elden) Phenix written in her 70s for her son George. Mary Jane, wife of John Phenix, was a sister to Mary Phenix Elden's father William. Apparently William named his daughter after his sister, down to the married name. The album is approximately 7" x 4-1/4" and contains the sentiments of nearly 80 people. An alphabetical list of the signers appears at the end of this post. 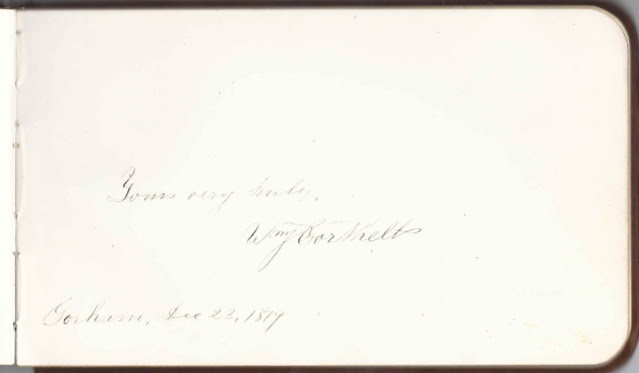 William J. Corthell signed a page at Gorham, Maine, on December 23, 1879. William Johnson Corthell, an 1854 graduate of Colby College, became the first principal at Gorham Normal School in 1878 and held the post until 1905. 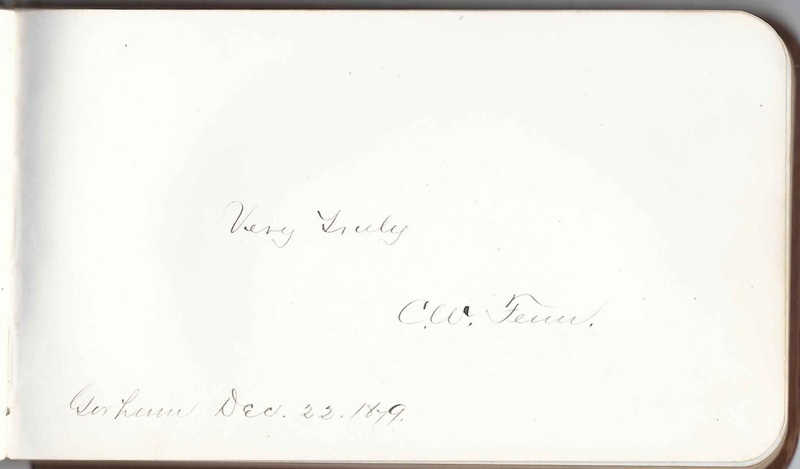 Instructor Charles W. Fenn signed a page at Gorham, Maine, on December 22, 1879. Harry H. Bryant, who may have been related to Mary Phenix Elden on her mother's side, signed a page on September 10, 1881 and created the only sketch in the album, a very nice one. If after reading the information above and going through the list of signers, you feel the album owner was someone other than Mary Phenix Elden, please leave a comment or contact me directly. Thanks! William J. Corthell, signed at Gorham, Maine, on December 23, 1879. He became the first principal of Gorham Normal School in 1878. William Johnson Corthell was born at Addison, Maine, on 11 July 1828. He was educated at Colby College. Died at Calais, Maine, on 1 November 1908. C. W. Fenn, signed at Gorham, Maine, on December 22, 1879. Charles W. Fenn was an instructor at Gorham Normal School until approximately 1883. 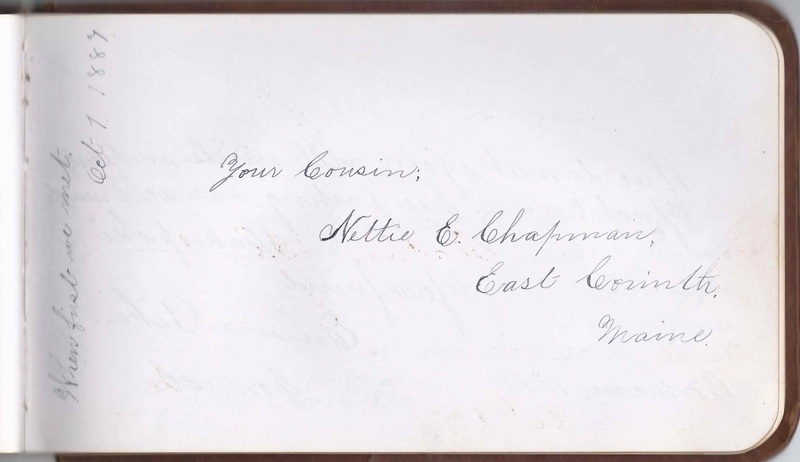 Etta L. Gay of Saco, Maine, signed at Gorham Normal School in 1879. Henrietta L. Gay. I am so very excited by your post. Mary Phenix Elden was my 1st cousin 4xs remover. Her dad, William, and my 2xs great grandfather Perley G. Elden were brothers. I see he even signed her book. I'm actually related to quite a few of the people in the album.